On December 1st, the JNF held a celebration in Geneva for its 110th anniversary with the benefits of the evening going for the retimbering of the Mount Carmel forest, destroyed a year ago by a fire. The evening was placed under the high patronage of the ambassador of Israel to the UN in Geneva, guests of honour were Reuven Rivlin, president of the Knesset and Efi Stenzler, world president of the JNF. The event, featured a concert of the Ra’anana Symphonette Orchestra performing among others, the world première of “Hebrew Suite” a piece composed by Yvgeni Levitas specially for the 110th anniversary of the JNF. The event received the support of the City of Geneva in the form of usage of city-owned premises with a special price reduction. The official support of the City, with its logo always in most prominent position among all sponsors, was abundantly mentioned in the promotion (flyers, posters, program, webside) of the event. Upon learning about this event, a group of municipal counselors tabled a motion to investigate how the city ended in a position of subsidizing an organization involved in human rights abuses, citing the amnesty campaign against the JNF. The motion was delayed until the January session of the City’s parliament. However, the City’s Administrative Council felt compelled to respond to the motion on the eve of the JNF celebration and determined that the decision, taken by the cultural department of the previous municipal administration, was in error, and the JNF did not meet the criteria for receiving city support (Press Release, November 30, 2011, M. Philippe d’Espine, Chargé de l’information du Conseil administratif). The legal basis cited was the exclusion of events “exhibiting the character of political propaganda, religious propaganda, military propaganda or sectarian practices. ”The Council, regretting that it was impossible to reverse the decision so close to the event, nevertheless made public that it “de-solidarizes itself firmly from the support” given by the city to the event. This is an important victory in the struggle against this racist and colonialist organization, and an indication to the growing difficulty of the JNF to hide its crimes. The victory received important press coverage. 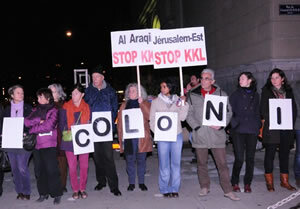 Unsurprisingly, the local JNF branch complained about the decision of the City who “gave way to the pressures of extremists and anti-israel lobbies” arguing that the Suisse association was “an apolitical gathering of citizens engaged in favor of environmental protection and sustainable development in Israel.“ The JNF press release concludes stating that “KKL Switzerland will continue to act, as it is doing since 110 years, in favour of farming and afforestation of formerly desert regions in Israel” (see this). These, as is well known, are lies. The JNF is engaged in ethnic cleansing in the Negev, East Jerusalem, and the Occupied Palestinian Territories, and manages 93% of the public land in Israel for the sole benefit of Jews, thus helping the government circumvent Israel’s (already paltry) legal civic protections of equal rights and facilitating Israel’s ongoing colonization, discrimination against Palestinians, and stealing of Palestinian land. The Palestine solidarity committee Urgence Palestine will continue to press forward with the demands for investigating the KKL and excluding it from all public subsidies. Urgence Palestine also organized a picketing of the event, and four picketers (a Municipal councillor, a young Palestinian and two young women, one wearing an ostensible Kuffieh) entered the event to provide silent testimony against JNF racism. Unfortunately, the Geneva police dishonestly prevented the picketing from being seen by the attendees, an act that constitutes “a grave violation of the right of free expression and assembly guaranteed by the constitution” (Press Release, November 30). The picketing took place at a distance of about 100 meters from the entrance to the concert hall despite police interference, and a complaint will be pursued. More pictures of the picket can be seen at here and here.